We help businesses make more money online. We’ve achieved results for clients across eCommerce & lead generation websites. Whether you’re an online retailer or a local service business, our experienced team can assist with an SEO acquisition strategy tailored for you. 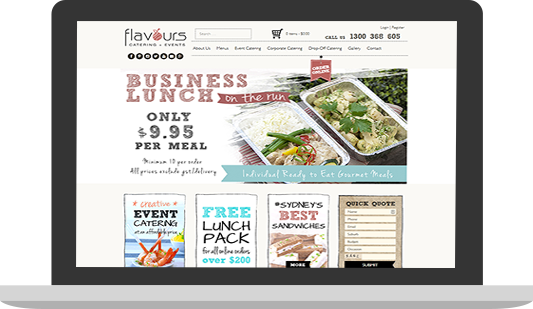 We were engaged by Flavours Catering to improve their organic traffic results, after results with their previous agency had plateaued. Our team performed a range of onsite optimisation, content creation and content outreach/promotion work, which lead to significant visibility in the Google search results. 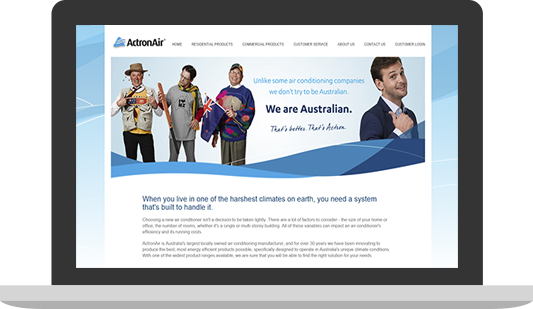 Local Digital took over the digital marketing for Australian air conditioning manufacturer ActronAir as they launched a multi-million dollar above the line advertising campaign. Our results to date have been a drastic improvement on what the previous agency achieved with more leads generated at a substantially lower cost. Acorn Rentals are Australia's leading supplier of courtesy cars to people that have been involved in an accident. This 25 year old company has offices in every capital city and have turned to digital marketing with Local Digital to increase their user base Australia-wide. Massive returns for a local service business. Local Digital was engaged by Fernair, a leading air conditioning business in Newcastle. They were shifting their focus from the commercial to residential market. We built a new website better suited to generating consumer leads, then built a Google AdWords campaign to support it. Through ongoing optimisation we have achieved over 30 qualified leads per month for the client. Our work with Dominic Sergi and Michael Costin aimed to improve the Google AdWords and Search Engine Optimisation for the NETGEAR Australia & New Zealand websites. The results we were able to achieve while working with Dom over the past 2 years speak for themselves, site traffic grew month on month while our cost per acquisition continued to decrease over time, and the level of service and attention to detail meant working with him was an absolute pleasure. We made the move to work with a new search agency. As most people know, it is always hard to leave something behind and restart the process with new hands, but I can attest that the move for our company to work with Dominic & Michael in the Search team was seamless, professional & a game changer. Both Dom & Michael were hands on from the get go. Their approachable & fast working nature allowed for our teams to work strategically, helping our brand achieve the agreed goals faster. They brought new approaches to our search and online marketing, which had never been engaged by our previous agencies. Dom & Michael took on new projects to better our brand with no effort from our end. They made our ‘search lives’ a lot easier, and it was one less thing for us to worry about so we could focus on other critical projects. They continually reviewed and implemented new strategies to help better & improve our online shopping experience which resulted in increased rankings and conversions. I highly recommend these guys; they have been nothing but a true asset and what we refer to as an extension of our ‘work family’. We are very busy at the moment, with a record number of cars on the road. That is down to a combination of your Google campaign and the new site you designed us. Very good news as we have been sitting 36% below this level for a couple of months prior.